Being a single parent is never easy. Not only do you have to work to keep a roof over your head, you have to take care of the children. It is not easy especially when it comes to saving money. There are however ways to save more money than ever before even as a single parent. Here are a few tips to become a super-saving single parent. One of the most important things you can do is to confide in your children your current situation. If your children are old enough to start understanding how life works (12 years old at least), let them know what you are going through. The best way to save is to save as a family. If your children know that you are going through a tough time, they will do all they can to help you save as much money as possible. After all, isn’t the ultimate goal a better life for everyone? What better way to save money than save as a family? 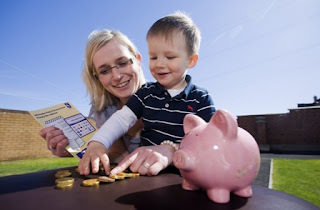 One of the most effective ways to save is to educate the family on saving tips. Shutting off the lights when you leave a room, closing the tap completely, taking your bicycle instead of public transport are just a few ways you can save. When another family member forgets, remind them. If the family does not know how much money you can save using these simple tips, how will they ever help you? One of the best ways to budget as a single parent is to give everyone a budget. Depending on the age and needs of each member, allocate a specific amount of money they will use for their monthly needs. This will make them spend money within their budget rather than spending and then asking for more money later. If you have expertise on changing a switch, try doing it yourself instead of calling an expensive electrician. If you can help mom with the dishes, do it so that she does not have to use the dishwasher and a lot of electricity. Try gardening as a family as it is fun, great exercise, educational and brings the family together. In this day and age, the only way you can really save is as a family. This is especially true for single parent families where there is more often than not only one earning member. Saving as a family is a great way to save money. You can use the saved money at the end of the year to improve your own living standards or you can treat the kids every month to reward them for their hard work. With so many single parents today because of the high divorce rates, it's important for children who are old enough to understand. If we start by not giving our children everything, it will be easier for them to adjust if the need arises.